Working on the sea ice of Kobbefjord, near Nuuk, Greenland (March 2015). My article about Olympia Oysters, written for WSG’s newsletter, Sea Star, was picked up by Hood Canal’s local magazine, Tracing the Fjord. You can find the article on page 20 of their Fall 2018 issue. This August and September 2018 I'll be sailing about the Swedish icebreaker Oden, working with our post doc to study sea ice algae and collecting my own data on bacteriophage dynamics in sea ice. You can read more about the cruise and its many research projects here. We had a successful trip to the Utqiagvik, AK in May 2018 to study gene flow in subzero brines! The Deming lab visited Portland, OR in February 2018 where I presented some research on microbial motility in subzero brines, work done in collaboration with a group of engineers and scientists at CalTech using microscopy for life detection. In September, 2017 our lab visited Nuuk, Greenland to present our research at the Polar and Alpine Microbiology (PAM) conference. My poster on virus-bacteria dynamics in sea ice won the best poster award! June 25th - 30th, 2017 I attended the Dartmouth Science and Diplomacy in the Arctic workshop to learn more about the role of science in Arctic Policy. Activities will include a model Arctic Council meeting, as well as lectures on Arctic diplomacy. I'm a PhD candidate at the University of Washington in Oceanography and Astrobiology. My interests focus on bacteria and bacteriophage viruses in extreme environments, namely cold, briney sea ice in the Arctic and Southern oceans, and how knowledge of these bacteria informs the search for life on cold bodies in our solar system and beyond. 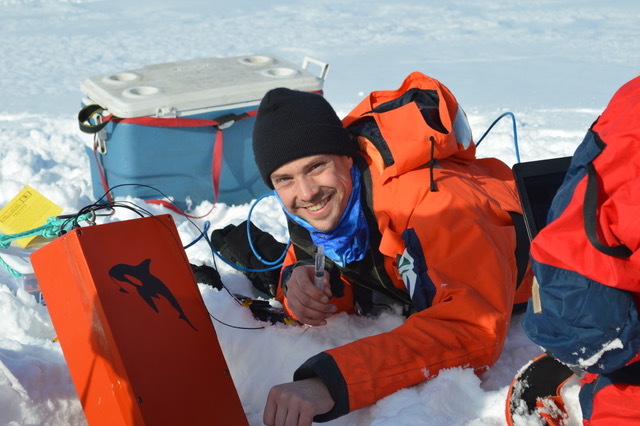 I work in the Deming Lab at the UW, doing regular experiments in the lab as well as regular field work to the Arctic and Antarctic. In addition to scientific research, I have an interest in science for both the public policy and outreach. I am interested in policy in the Arctic, and how scientific research of the environment can inform decision making on international scales. In addition, my science communication focuses on human elements of research and discovery in written and broadcast media. You can learn more about my research and view my CV here.